Quality handmade natural toys in the Waldorf tradition. Our toys are simple, child-led, open-ended to inspire imagination. We bring quality and experience to all we create and look forward to working with you to provide wonder full play experiences for your little ones! Why not join our community at Facebook http://facebook.com/beneaththerowantree , IG @beneaththerowantree or our Blog at http://beneaththerowantree.com (free tutorials, patterns and play ideas)? Visit our profile for website and gallery links. 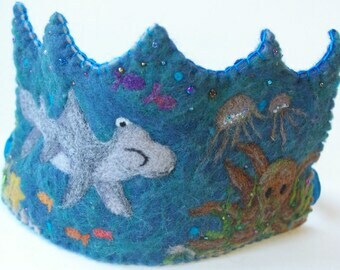 This crown makes for a beautiful unique gift. It is colorful, enchanting and will last for many birthdays and special occasions. My granddaughter adores it! I am a returning customer. We love all of Lori's unique gifts. We have many silks, play wands and some of our favorites are the felted Easter eggs. Beautiful! Easter Bunny shops here, naturally! The steam, clanging pots, the tang of vinegar, the magic & science of dyeing... all in our kitchen, every bit of silk! I love to play with textures & colours ~blending techniques and fibers (like wool and silk) together. That is... I never meant to start a business. As the mother of a 2 year old, I was committed to sharing a wonder full childhood with my daughter~ for our family this meant avoiding commercialism, providing natural toys and nature experiences, and allowing our child to grow up slowly in a small town in Northern Ontario. I started making clothing and toys for our daughter when I was unable to find these items to fit our family values and lifestyle in our own area. And given my tendency to really commit to the things I love~ I just couldn't stop... we were on to something that is GOOD for children that had been forgotten by so many... open ended, imaginative play, natural and simple childhood.... and I wanted to share it! In the past 9 years I have grown into my own skin as an artist and artisan, even as I have grown into motherhood in all of its fullness. (And I am even starting to feel, at 42, like I might be a teeny tiny bit of a grownup once in a while). What an amazing journey... to find within one's self, deep wells of possibility awaiting creative expression! I highly recommend it! So it is that BTRT is the means for our family to share our commitment to the value of children and childhood. More than any product, our purpose is what drives the business... and more than ever, I am a believer in the power of play to open up worlds of wonder for our children~ much needed in an age where imagination, art and the questing soul are given so little regard. They are made by my hands . And they are always COLOURFUL (spelled the Canadian way!). Everything is made in our home, amidst the general chaos of daily life which includes homeschooling, dogs, the arrivals and departures of my truck driver husband, my ministry and lots and lots of craft supplies, music, colour and joy. Welcome to BTRT where we are a passionate about toys made with natural materials toys and designed to encourage wonder and imagination. We are a family based, Canadian shop. If you are concerned with the quality or workmanship of an item contact us immediately. New items must be shipped back to us within five days (in the mail in that time) of receiving the item. Refunds will be made once the item arrives back to us in the same condition it went out. Down the road, if you have issue with an item, contact us to discuss your concerns. We do our best to describe items thoroughly, including the size, colour and measurements. We do not refund for size or colour issues. In some cases exchanges can be made. Ask about sizing, colour and for more pictures if you are uncertain about an item before purchase. We accept PAYPAL & ETSY Direct Payment. We commit to shipping by our stated deadlines, which are within the dates from Canada Post for holiday delivery~ however, without tracking, we cannot guarantee specific delivery dates. In 10 years we have been very pleased with the postal services' commitment to making holidays happy with timely deliveries! Thank you for choosing BTRT! Please observe dates for order placement, in order to ensure Christmas delivery. Please contact us right away to upgrade. FLAT RATE shipping includes standard air service without tracking. All silk items are dyed to order, please allow 4-5 business days for completion. Wishing you many hours of happy play! If you are concerned about the arrival of your item, please let us know. *Business days = Monday - Friday, excluding holidays. We do answer some correspondence on the weekends, but as a rule we try to take the weekends for home and family time. Allergy Alert: We do have a dog in the home, but not in our studio space. We do not use any scented products (detergent etc) in our house due to sensitivities and allergies. Sizes are described for each item. If you are purchasing for a specific use or space, please be sure to measure before ordering. As each silk piece is dyed custom for you, returns and exchanges are not generally made for pieces that are their described dimensions. Every silk item will arrive with a postcard bearing detailed information about the item and its care. Generally, treat silk like your own hair (a protein fiber)~ wash gently in warm to cool water with a gentle shampoo or dish soap and hang to dry. Avoid laundry detergent. Direct sunlight (ie on a clothesline) can quickly damage silk. Tumble dry low for a brief time, best of all~ press with a warm iron while damp.